Range of attack, it is important to pick a weapon that fits your playstyle. Every weapon type has their own way of handling it and their own attack speed and distance. 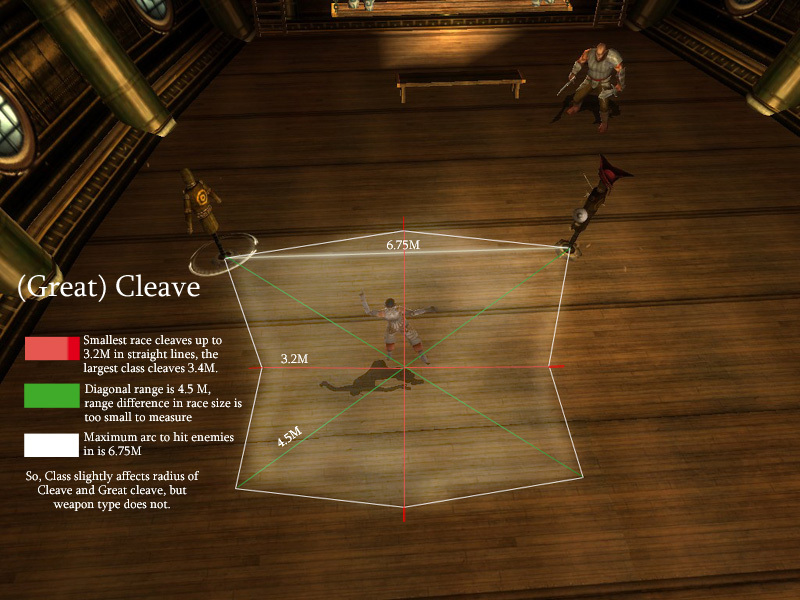 This chart Is made with Great cleave, which has a bigger range then regular cleave as that attack does not hit enemies behind the player. Interesting is that the diagonal lines almost have 50% more range then the straight lines. Also interesting is that size only matters in race and not in weapon, the biggest race can hit straight lines slightly further (20/30CM), on diagonal lines this difference is so small it can’t be measured properly. Weapons however, will all have the same range when you use Cleave, Barehanded cleaves will get just as far as a club of the scrag. This only counts for cleave, below I explain the difference between weapon range in normal attacks. 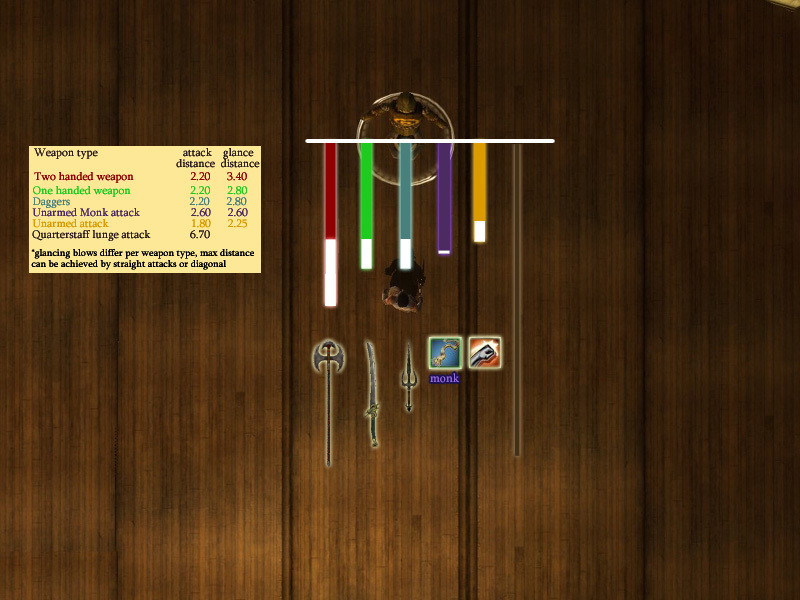 The chart is on scale, when you are in front of the dummy you should be able to hit it if you stand exactly on the bottom line if your weapon type. Two handed weapons have twice as much glancing blow range as one handed weapons. Also interesting is that monks actually get slightly more range with handwraps. Subsequent attacks also have different ranges. Server lag does give display errors in this, so when hitting while you or a monster is moving it might seem like you have more range or less. While magic attacks and Ki attacks have a fixed range (25meters, 50 meters enhanced), Bow and arrow seems to have unlimited range. 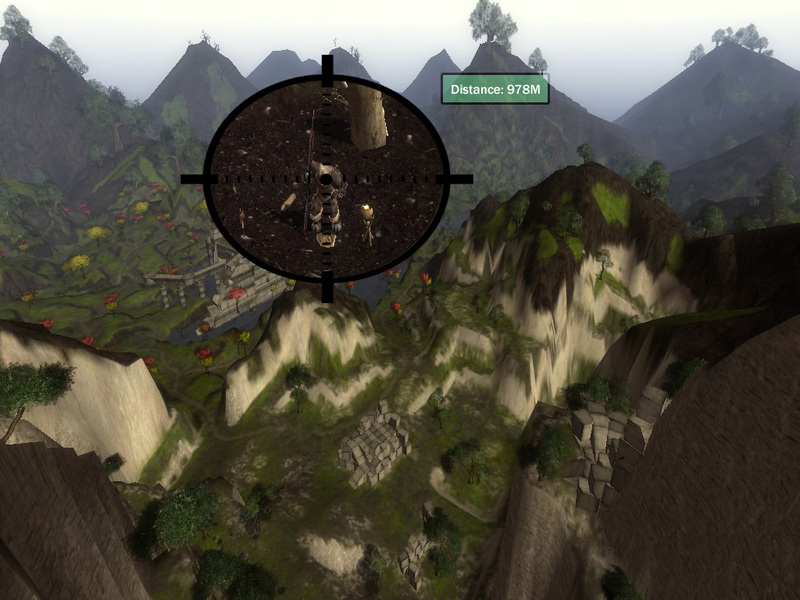 I have tested this in vale by aiming at the Devil pit in front of Coalescence Chamber from the Vista explorer sniper spot and I managed to damage an Orthon that was later measured at a distance of 978 Meters. To bring it in perspective, walking from Marketplace entrance to the airship portal is 220 Meters distance, so it’s possible to shoot something more then four marketplaces away.